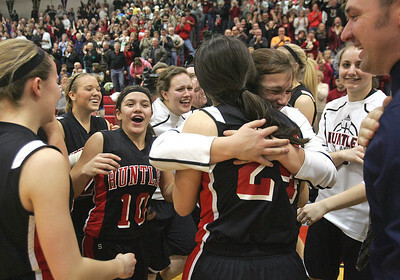 The Huntley girls basketball team beat Wheaton Warrenville South, 47-43, on Monday to reach the state finals for the first time. 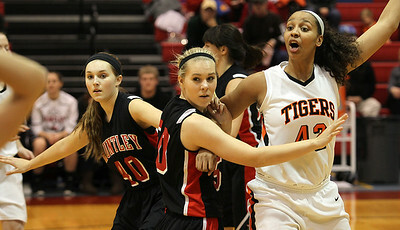 H. Rick Bamman - hbamman@shawmedia.com Huntley defenders Sam Andrews (left) and Ali Andrews double team Wheaton Warrenville South's Diamond Thompson in the Class 4A Dundee-Crown Supersectional Monday, Feb. 25, 2013. 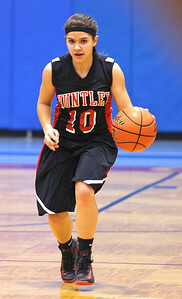 Huntley won 47-43. H. Rick Bamman - hbamman@shawmedia.com Huntley's Bethany Zornow (left) drives past Wheaton Warrenville South devender Olivia Linebarger in the fouth quarter of Class 4A Dundee-Crown Supersectional Monday, Feb. 25, 2013. 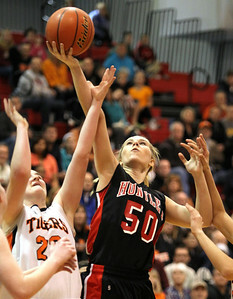 Huntley won 47-43. H. Rick Bamman - hbamman@shawmedia.com Huntley's Kayla Barreto brings the ball upcourt in the first half againt Wheaton Warrenville South in the Class 4A Dundee-Crown Supersectional Monday, Feb. 25, 2013. Huntley won 47-43. H. Rick Bamman - hbamman@shawmedia.com Huntley fans watch as the girls basketball team beats Wheaton Warrenville South, 47-43, on Monday to reach the state finals for the first time. H. Rick Bamman - hbamman@shawmedia.com Huntley's Sam Andrews (40) looks for an open teammate while Wheaton Warrenville South's Kelly Langlas (20) and Olivia Linebarger (44) defend in the Class 4A Dundee-Crown Supersectional Monday, Feb. 25, 2013. 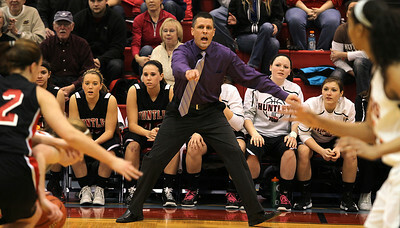 Huntley won 47-43. H. Rick Bamman - hbamman@shawmedia.com Huntley's head coach Steve Raethz directs his players in the second quarter against Wheaton Warrenville South in the Class 4A Dundee-Crown Supersectional. 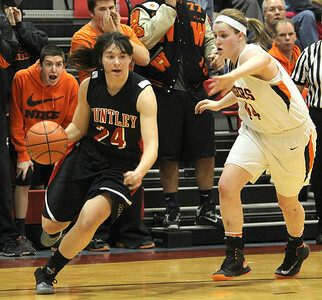 The Huntley girls basketball team beat Wheaton Warrenville South, 47-43, on Monday to reach the state finals for the first time. H. Rick Bamman - hbamman@shawmedia.com Huntley's Ali Andrews shoots past Wheaton Warrenville South devenders i the fouth quarter of Class 4A Dundee-Crown Supersectional Monday, Feb. 25, 2013. 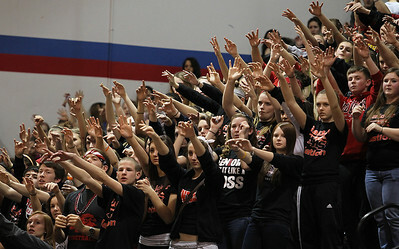 Huntley won 47-43. H. Rick Bamman - hbamman@shawmedia.com The Huntley Red Raiders celebrate their victory over Wheaton Warrenville South in the Class 4A Dundee-Crown Supersectional Monday, Feb. 25, 2013. 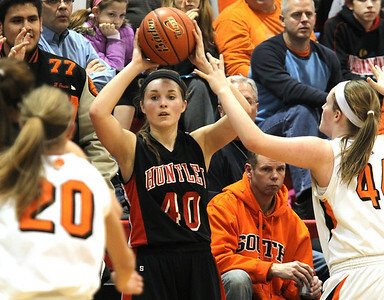 The Huntley girls basketball team beat Wheaton Warrenville South, 47-43, on Monday to reach the state finals for the first time. Huntley fans watch as the girls basketball team beats Wheaton Warrenville South, 47-43, on Monday to reach the state finals for the first time.